ROBOTC.net forums - View topic - Can't access "Ruins of Atlantis"
Re: Can't access "Ruins of Atlantis"
2) Select VEX 2.0 Cortex as your platform type. 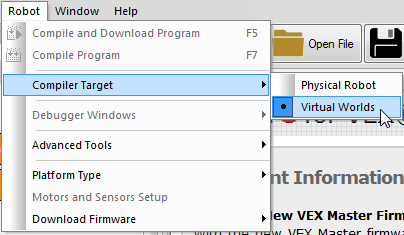 3) Select your compiler target as Virtual Worlds. 4) Select Ruins of Atlantis as your world you want to use. 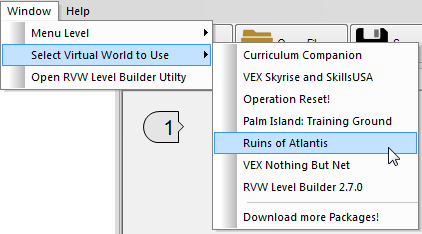 Window -> Select world to use -> Ruins of Atlantis. 5) Create a new file. 6) Compile and download your program. This will automatically open Ruins of Atlantis. It helped me too. Thanks for assistance here.